By Dan Ambrose: WBO light heavyweight champion Sergey Kovalev (25-0-1, 23 KOs) thinks that IBF/WBA champion Bernard Hopkins (55-6-2, 32 KOs) sometimes reverts to acting if things aren’t going well for him in his fights. Kovalev specifically mentions Hopkins’ first fight against Chad Dawson in October 2011, a fight in which Hopkins complained that he suffered a shoulder injury in the 2nd round. The fight bout was then halted, and the fight was ultimately ruled as a no contest. Kovalev feels that Hopkins realized after the 1st round that he wasn’t going to win the fight. Kovalev thinks that Hopkins could make their November 8th fight dirty if things don’t go his way early on. However, it might not be a case of Hopkins specifically fighting dirty, but rather him acting out. “He [Hopkins] can cut you from the head, from the elbow, everything, from any part of his body. He is looking like a very dirty fighter,” Kovalev said about Hopkins. Kovalev has already said that if Hopkins chooses to take the fight into the gutter on 11/8, he’ll respond in kind by playing with the same kind of rules. If the fight does turn out to be a dirty one, then the referee David Fields is going to need to get control over it somehow before someone gets seriously hurt. What we don’t want to see is one of the fighters unable to continue fighting due to a foul. Kovalev might need to be careful in responding to Hopkins’ fouls, if he does choose to foul, because we saw Hopkins unable to get up off the canvas in his first fight against Chad Dawson. There was nothing Dawson could do about it because he picked Hopkins up and dropped him on the canvas. If Kovalev fouls Hopkins in response to something that he did, Kovalev could potentially be putting himself in a situation where he’ll lose the fight if Hopkins hits the deck and doesn’t get up from the foul. “He [Hopkins] is a good actor. If he is feeling like he can’t do something legally, he start playing like an actor and complaining about pain or a low blow or something,” Kovalev said. “Like in his first fight against Chad Dawson, he was not ready for this fight. I saw his first round and after first round he understood that he is not going to win this fight and he complained he hurt his shoulder and got TD [technical draw] but he still keep title,” Kovalev said. 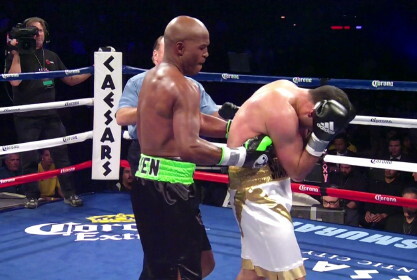 « Bernard Hopkins: Will the curtain of his career fall on Nov 8th?